Trained at the Royal Academy schools in London and Académie Julian in Paris, Gordon Coutts arrived in Melbourne and took up studies at the National Gallery of Victoria Art School. 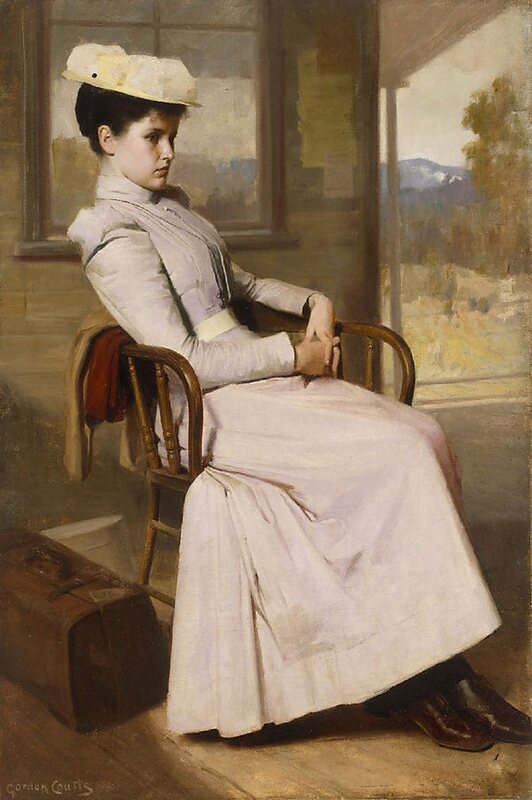 He met Tom Roberts there, whose influence is reflected in this portrait of a young woman seated in the waiting room of a wayside station in the bush. The model, in fact, posed inside a studio, with the background painted around her afterwards. This popular painting is the artist's most esteemed Australian work. The femininity of the sitter and her fashionable attire were trademarks of portrait and genre styles at the time. Signed l.l., "Gordon Coutts". Not dated. Maurice Brodzky (Editor), Table talk , 'Victorian Artists' Exhibition, pg. 6, Melbourne, 20 Sep 1895, 6. Review of the 1895 Victorian Artists' Exhibition. The complete book of great Australian women: thirty-six women who changed the course of Australia , Pymble, 2003, back cover (colour illus., detail). Alison Inglis, For Auld Lang Syne: images of Scottish Australia from First Fleet to Federation , 'Patronage and plaid: Scottish-Australian artists and patrons of art in the colonial period', pg. 275-309, Ballarat, 2014, 292 (colour illus. ), 293. Bruce James, Art Gallery of New South Wales handbook , 'Australian Collection: Painting and Sculpture', pg. 102-181, Sydney, 1999, 123 (colour illus.). Unknown, Ma Brillante Carrière , Australia, 1995, cover (illus.). Unknown and Unknown, My brilliant career. Read by Miranda Otto , Artarmon, 1994, cover (colour illus.). Editor Unknown, The Australian star , 'Art Society's Show', pg. 3, Sydney, 12 Aug 1897, 3. Review of the Art Society of NSW's Annual Exhibition. Editor Unknown (Editor), Daily telegraph , 'The Art Society's Exhibition', pg. 3, Sydney, 17 Oct 1896, 3 (illus.). Review of the Art Society of NSW's Annual Exhibition, with illustration of 'Waiting'. Editor Unknown (Editor), Sydney mail and New South Wales advertiser , 'The Art Society's Show', pg. 808-810, Sydney, 17 Oct 1896, 808, 809 (illus.). Review of the Art Society of NSW's Annual Exhibition, with illustration of 'Waiting'. Editor Unknown (Editor), The Sydney Morning Herald , 'Art Society's exhibition', pg. 7, Sydney, 10 Oct 1896, 7. Review of the Art Society of NSW's Annual Exhibition. Editor Unknown, The Australian star , Sydney, 10 Oct 1896. Editor Unknown (Editor), The Argus , 'Victorian art. The annual winter exhibition', pg. 6, Melbourne, 20 Sep 1895, 6. Parade: The story of fashion in Australia , 'Victorian Virtue', pg. 19-37, Pymble, 1998, 36 (colour illus. ), 37. Unknown, My brilliant career. Read by Miranda Otto , Ultimo, circa 2004, cover (colour illus.). 3-CD audio book (abridged) of 'My brilliant career', read by Miranda Otto.